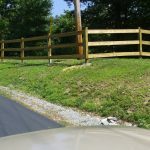 We finally completed the fencing of the extra property we had! 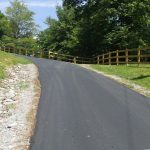 Our original property is an 11 acre lot where our office building & guest house is located. There’s probably about 8 acres that are fields but we couldn’t use because of inadequate or non existent fencing. The second piece of property where our house & barn sits is a 4 acres lot which is completely fenced in. 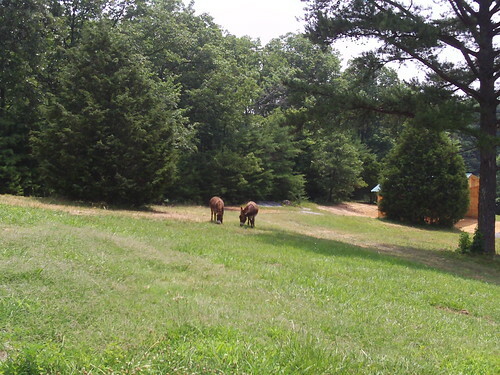 Both the perimeter of the house and the pastures for the animals. There are probably only 2 acres that the animals can actually graze on. Between the miniature donkeys, miniature horses, Ziggy, the Llamas & the goats, that wasn’t quite enough. With the addition of Coquette (formerly Snowball), and her foal, it was obvious that there wasn’t enough pasture & I was looking at big hay bills! Not to mention that Coquette is pregnant & Ol’Blue may be too. At the end of July the donkeys will be bred so we’re looking at about 11 horses/donkeys by the end of next year. We made arrangements to have the 11 acres on the original lot fenced along with a fenced path go get between the pastures. Well, that all got completed today & I was very excited to introduce the donks & horses to their new “digs”. Although the donkeys followed me to the new path, it took a bucket with a bit of feed to lure the horses in. But once they were in and discovered all of this open space, they ran like a little stampede & explored their boundaries. Within their new pasture, they can come and visit us at the office and now they can walk around the guest house. The dogs will have to get used to their presence but they’ll get over the newness. I look forward to going to the office in the morning and being greeted by my little friends. All it takes is for me to show up with treats and they’ll know to wait for me by the fence. We’re planning on painting the fence white but we have to wait until the wood cures. I’m sure it will be even more attractive once painted! More pictures soon! 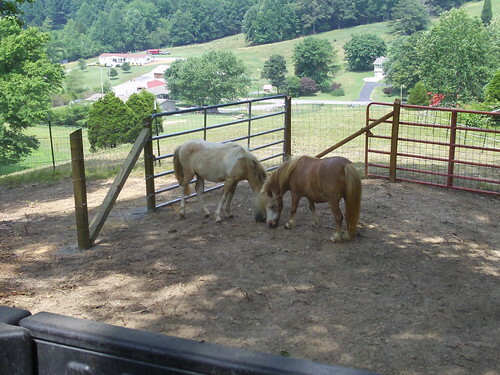 It sure is lovely here at the Dreams Come True Minis farm!